Steven Universe bent the laws of time and space in this week’s “Out of This World” miniseries. Not only to test how strong the bonds of love between Steven and the Gems actually are—obviously, their love is indestructible—but to explore all sorts of families, loving and functional, traditional and non-traditional, while including new twists involving the Gem homeworld. “Steven’s Dream,” the first episode of what it generally known as a “Steven Bomb” (a clump of episodes released all at once), establishes one of the running themes for the arc by actually showing Steven and the Gems at their most contentious. 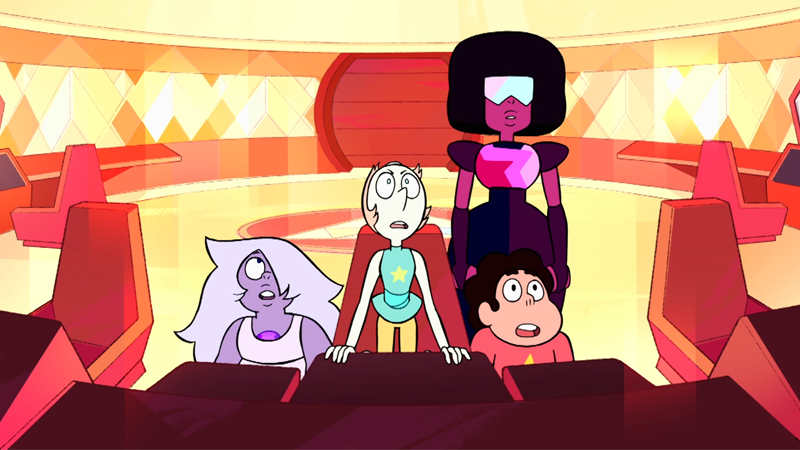 After realizing the series of strange dreams he’s been having are related to Pink Diamond’s shattering, Steven asks the Gems to explain what the mysterious palanquin he keeps seeing is. Rather than flat out telling him that it’s an ancient piece of Homeworld technology, Garnet and Pearl attempt to quell Steven’s curiosity out of fear of what he might find. Steven, understandably hurt, confronts the Gems about their lying to him and takes the initiative (with the help of Greg and Uncle Andy) to track down the palanquin on his own. What Steven and Greg find after an excellent montage of them touring through South Korea is Blue Diamond (Lisa Hannigan), sitting an otherworldly shiva for Pink Diamond at the place where she was shattered during the Gem War. It’s in this moment that you get a sense if it weren’t for Steven’s curiosity, there’d always be things about homeworld the Gems kept from him. Steven Universe has touched on the idea of family members inadvertently hurting one another in the past in order, but “Steven’s Dream” takes things a step forward and challenges us to remember that sometimes, family members lie to and hurt one another explicitly because they’re trying to protect the people they love. However, the tension between Steven and the Gems quickly evaporates when Greg’s kidnapped by Blue Diamond and spirited away to Pink Diamond’s human zoo on a far off Gem ship. As the space chase ensues, Out of This World shifts its focus away from the Crystal Gems and give us a glimpse of the Homeworld culture they left behind. Once Steven and the Gems step off their ship into the zoo, they’re separated by happenstance that leads to a pair of very different plotlines about family and belonging that are both firsts for Steven Universe. While Steven ends up in the zoo proper while looking for Greg, Amethyst is confronted by other Amethysts for the very first time and developed a powerful, immediate kinship with them. The interactions between Amethyst, her fully-grown sister Amethysts, and their domineering manager Holly Blue Agate, suddenly give Amethyst the closest thing she’s ever had to a “biological” family, and one of the episode’s biggest and most pleasant surprises is discovering how our Amethyst and the others immediately came together after discovering they were all created in the same Kindergarten on Earth. Elsewhere on the ship, not only does Steven find Greg in the zoo, he also discovers the small community of Zoomen (the humans born in the zoo, as their ancestor were seized thousands of years ago) living inside it who don’t know that they’re actually being imprisoned. On its surface, “The Zoo” episode is a straight-up “paradise as prison” trope. The normal course of such stories is to prove to the prisoners that their captivity is a bad thing, and freedom—even if it means leaving paradise—is worth it. This is certainly what Steven believes, as he exhorts them to take their freedom, although no one takes him up on it. But Steven Universe subverts this because not only do the Zoomen come across as a collective of happy, if simple people, the show reveals them as a queer, polyamorous family. This is driven home the moment of “The Choosening,” where the zoo’s voice—which controls all elements of the Zoomen’s life in captivity and their daily routine—picks out partners off the Zoomen together in a very telling fashion. It’s not clear how often the Choosening happens—Greg is surprised by it, and he’s been captive for a little while—but obviously this is something that happens regularly, not permanently, yet the Zoomen seem delighted by whoever they’re chosen to be with. They truly are presented as one big happy family, who all love each other equally. When Greg introduces the idea of them choosing their partners for themselves, the Zoomen, as a collective, decide that they’d all like to be in a communal relationship with Greg. It’s a quick fleeting moment of normalization for a distinctly non-normative type of relationship that doesn’t take itself too seriously, but also does the important work of treating it as valid. Ultimately, “Out of This World”’s biggest reveal focuses on the relationship between Blue and Yellow Diamond, who are revealed to be two sisters mourning the loss of a third and fighting to understand one another’s feelings. Blue, in her grief, has taken to weeping at the foot of Pink’s vacant throne, clinging to the remnants of Pink’s legacy. Yellow, on the other hand, copes (musically) by insisting that both their sadness is useless, and she and Blue owe it to themselves to focus on waging more wars and further expanding the Gem Empire. One reading of Yellow’s song What’s The Use of Feeling (Blue) sees Yellow struggling to help her sister cope with her grief, but fundamentally misunderstanding Blue’s needs. Another interpretation, however, could be that Yellow, whom we’ve never really seen displaying affection for anything other than her geoweapon, could see Pink’s shattering as an opportunity to further their empire, and is trying to use Blue’s grief to convince her to join. Like any family’s, the Diamonds’ relationship is messy, complicated, and shot through with subtext that we just can’t know yet. Steven Universe has always championed non-traditional families, and “Out of This World” is yet another example of the show exploring just how varied and amorphous a family can be as long as they truly care about each other. Sometimes that’s through blood, but it can also be from a shared experience. It can be a compact unit, or a crowd of people who all love rolling down hills. It doesn’t matter how the family is formed—it only matters that you’re part of it.